Actually I have three faces: What I love. What I liked. And where I eat. If you don’t have time or don’t feel skilled enough to read between the lines, among all the restaurants that got a BITE this year, I’m telling you where I’m eager to return. Actually, if you follow me on TwitterLINK, you may have noticed I can’t stay away long from ABC Kitchen by Jean-Georges. The charmingly fey spot attached to ABC Carpet and Home seems to have a special lure for Vongerichten too. I have a feeling he’s as emotionally involved here as anywhere in his fast-growing empire, infected by the primal market connection, Union Square, just a few blocks away. It’s more than just a pop-in for show, as I’m sure his chef de cuisine Dan Kluger can attest. Instinctively, any serious chef – and Jean-Georges is one of our city's towering masters -- responds to the seasons. No need to say “seasonal” on the menu or send out a press release announcing the first peas have arrived. It goes without saying. Some have chided Vongerichten for his tardy embrace of the timely, the local and the recycled. But then they taste. The awesome baby carrot salad with avocado and sour cream, a crunch of seeds and a citrus spritz. Beets on homemade yogurt. Raw mackerel transformed by a fresh ginger bath. I’ve already been back to Navy Beach. I wanted to see if chef Paul LaBue and a remarkably unsnooty front room crew could keep the cheerful welcome and precisions of the lunch we had on an almost deserted Memorial Day East Hampton weekend. A fiery red sun, like a giant duck egg, is slipping down into the water as we arrive two Fridays later. I don’t see the clams with chorizo in buttery broth that knocked me out on my first visit. And instead of the marvelous seafood and chips with fries I wrote about, I make a saner choice – salmon, rare, but not cool, as I always order it, full of flavor on garlicky noodles. 16 Navy Road. Montauk. 631 668 6868. It’s worth the effort to book a table at The Breslin. Photo: Steven Richter. I’m adding the Plaza’s condensed little feedery to the fall-in places the two of us go before or after the movies, a list that obviously skews UpperWestSide-esque: Fairway Café, Brooklyn Diner, Salumeria Rosi, Ed’s Chowder House. At Fairway (recently given a new lease on life after rumors it might close) we usually have burgers with bacon and grilled onions. Or I might have boneless dark meat chicken on the $21 menu. 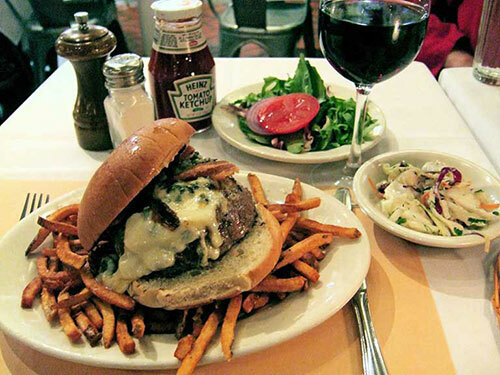 Sometimes the fries are great and the burger is perfect, sometimes not. It’s maddeningly uneven, but it’s always cheap. Occasionally we stay away till the memory of a bad night fades. Fruit pies are clearly made by human hands, warmed in the oven and served with ice cream. Upstairs at 2127 Broadway between 74th and 75th Streets, 212 595 1888. A two pound lobster with sides is $29 if you mention my name at Ed’s Chowder House. Chowder as a starter is non-negotiable for me at Ed’s. Steven likes the Manhattan crab or New England clam. I can’t resist the corn porridge. In winter I could never resist the spicy squash chowder, followed by the chopped salad with fried calamari. I tried the crab cake once and found it overwhelmed by too much too strong sauce. We might also share the Sunday seafood pasta. 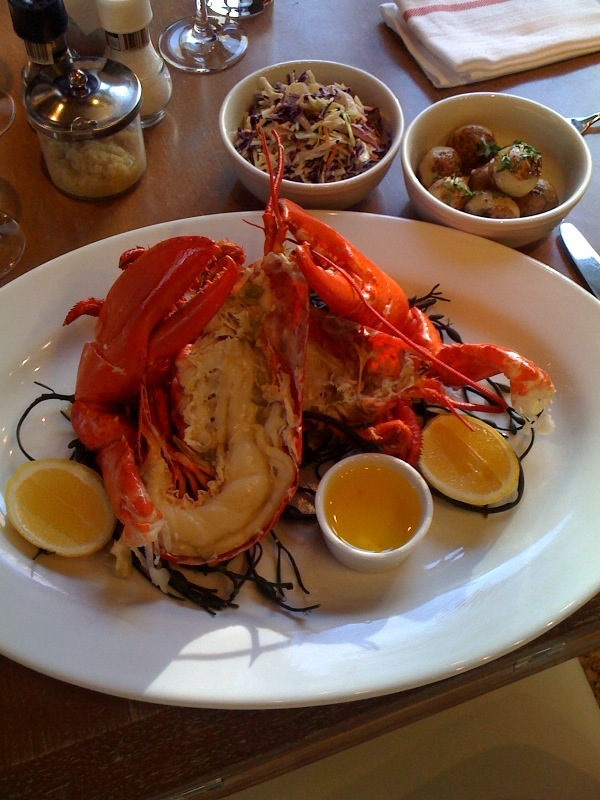 Our friends – and Insatiable followers - go for the $29 lobster deal only available through their ad here on my website -- it isn’t on the menu. 44 West 63rd Street at Broadway in the Empire Hotel, second floor. 212 956 1288. Café Fiorello used to be our number one after-movie hang but it’s priced itself out of easy temptation. Now we’re likely to go there for the $35 Restaurant Week dinner. 1900 Broadway between 64th and 63rd Streets. 212 595 5330 West Branch just got crossed off as a local go-to. Pastas too heavy-handed. Celeste used to be a favorite resort for the first-rate pizza. I would have Carmine’s mythic cheese plate as an entrée. Fans loiter outside patiently waiting, young couples, eating one course, sharing the modest check. But I found the kitchen demoralized two weeks ago and wandered if owner Gian-Carlo Gualtieri of Teodora has been by to taste lately. Even in its first week, I liked the food at The Lion and the old fashioned charm of its two-story atrium, but I haven’t been back because it’s too hot for me. I avoid Abe & Arthur’s for the same reason: Tall women swarming. Perversely, I brave the equally rarified air of the Standard Grill from time to time in a booth I get (confession) by calling a certain telephone number. Invariably I find someone to share the excellent chicken for two. 846 Washington Street between Little West 12th and 13th Streets. 212 645 4100. 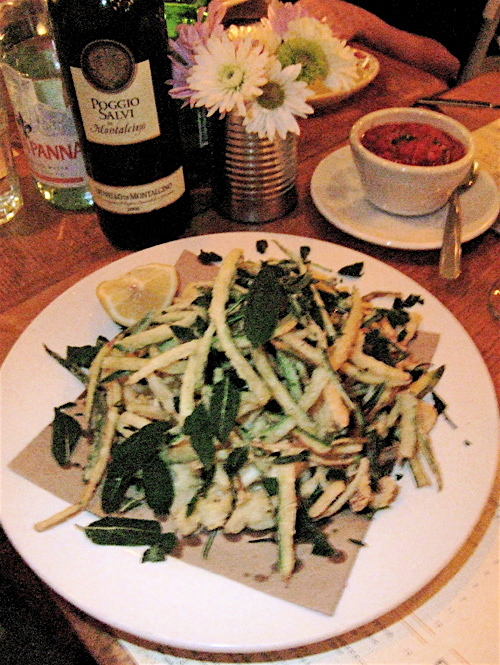 Fiore’s deep fried zucchini and calamari is a must for my guy. Photo: Seven Richter. Something missing here? “What about the greats of New York?” you want to know. When I’m not reviewing, I tend to pinch pennies. 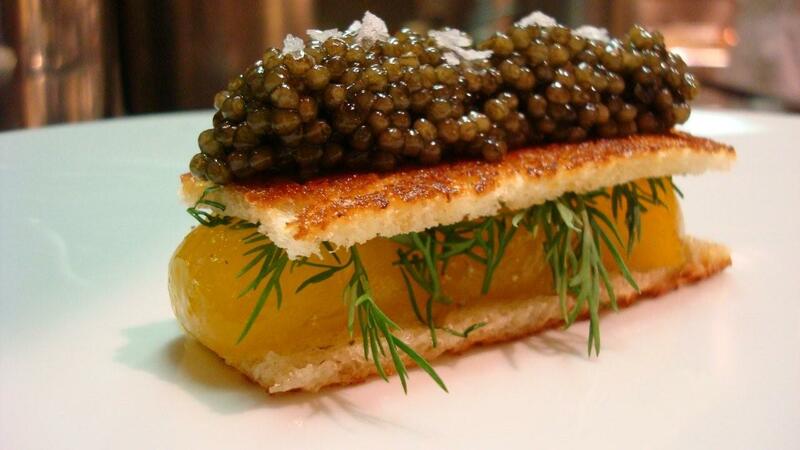 But if a friend is coming to town and tells me to reserve for us anywhere I want to go, I’ll be eating at Le Bernardin. Add Gotham Bar & Grill and Nobu downtown if our friend is staying over. Maybe we’ll make the trek to DBGB since he has a car and driver. Then I’ll take him to Salumeria to say thank you and insist on paying.